Students will be fascinated at their first encounter with our Cartesian Diver. 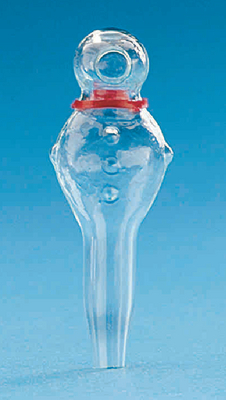 We supply a hollow glass diver, even shaped like a diver, with a 10" x 1 1/2" glass cylinder, a rubber sheet and rubber band. Fill the cylinder with water, drop in the diver so he floats, fasten the sheet tautly across the top and then gently depress the sheet. The diver will dive, his speed depending upon the pressure you place on the sheet; release the sheet and the diver returns to the surface. The diver’s behavior illustrates the uniform transmission of pressure in all directions, the compressibility of gases and Archimedes’ Principle.